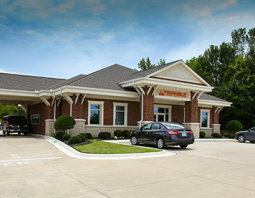 Triangle Federal Credit Union was charted in 1959 under the name of Columbus Air Force Base Federal Credit Union to serve the active and retired military personnel of CAFB. Beginning in 1987 the credit union expanded its field of membership to include approximately 50 employee groups including six of the largest employers in Lowndes County. They are Columbus Air Force Base, Baptist Memorial Hospital-GT, Lowndes County employees, Weyerhaeuser Co., Baldor Electric and Steel Dynamics. We are proud that our list of employee groups continues to grow everyday. In October of 2004, CAFB FCU expanded its geographical service area to include Lowndes, Clay and Oktibbeha counties. Anyone that lives, works, worships or attends school in these three counties is eligible for membership. In January 2006, CAFB FCU changed its name to Triangle Federal Credit Union to better reflect its ever-growing field of membership. TFCU currently has more than 13,000 members nation-wide with assets exceeding $80 million. Once a member joins, their immediate family members may join also. If a member leaves their current employer their account can remain open indefinitely.